WelHatCycling works with Hertfordshire County Council on cycle route plans for our district. The information below is what WelHatCycling currently know about plans. Comments and corrections are welcomed. Our own contribution to future planning is our Space for Cycling in Welwyn Hatfield [PDF] document which we have circulated to local councillors and our MP, Grant Shapps. We lobby as and when we can to see these plans fulfilled. Cyclestreets.net is an excellent route planner for the whole UK. WelHatCycling keep the local pages up to date. We have documented what we would like to see in the future in our Space For Cycling plans with maps and photos. We also have two new cycling “tube” maps inspired by the recent CyclingUK campaign. These highlight the good, bad and ugly sections of local cycle routes. Look for the red lines which show where cycle routes are needed. Welwyn village and Oaklands to Monks Walk School and the cycle route on Bessemer Road to Welwyn Garden City. Cross town links in Welwyn Garden City and in particular ways to avoid The Campus gyratory system. Birchall Garden Suburb (proposed) to Mill Green along side the A414. 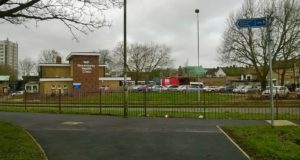 Hatfield town centre, linking the station to the business park and enabling children from Birchwood to have a safe route to Onslow and Bishops Hatfield Schools. South Hatfield links (but see some good news below). Good cycling routes built in all the new housing developments before the homes are occupied, so as to encourage cycling to schools, town centres and stations, rather than adding to local traffic. Although outside our area, this is still of interest to local cyclists. PDF map and details here. 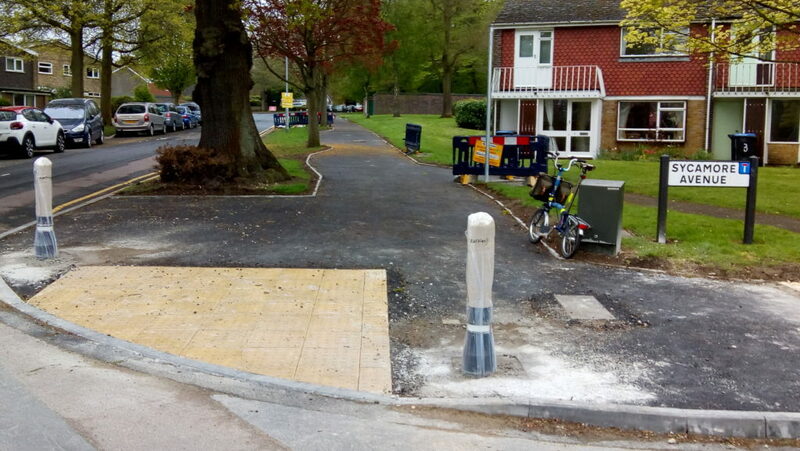 Our next new route extends the Woods Ave cycleway up Woods Ave to Bishops Rise, including a wider shared use pavement on the north side of the road and works at the Bishops Rise roundabout to enable access to the University Halls of Residence. The route was completed in May 2018. Photos of the works so far can be seen in a separate post and the completed route here. The three photos below give a flavour of the changes made. The photos shows the view from the end of the current cycle route at Oxlease looking west, up the hill to Bishops Rise. 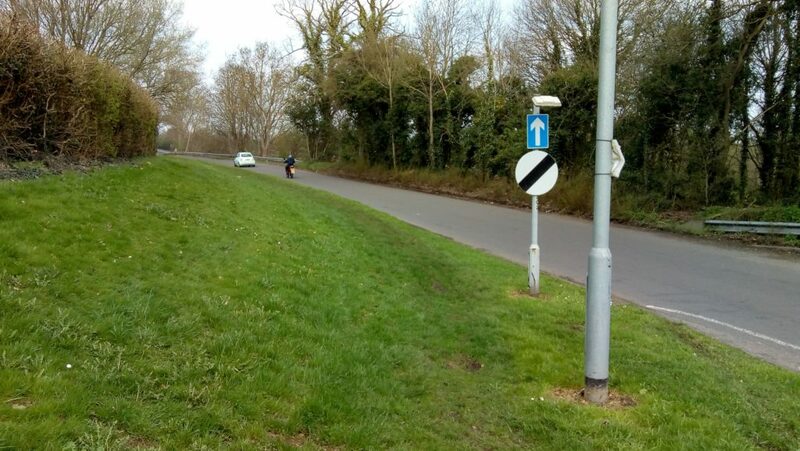 As can be seen in the more recent picture, the cycle path passes the large tree to the left on the current grass verge and then become shared use path for the rest of the route. Further up the hill the route is more complete. It just needs a top surface and markings. Eventually there will be a route from the Galleria to Hill Top and South Way connecting with this route. Some work on Bishops Rise is likely to happen alongside the rebuilding of the area around the Hill Top shops, funded by planning gain. A WelHatCycling lobbying success! The path from the Market Square toucan crossing to old French Horn Lane by the Telephone Exchange is now dual use. This is the final link in the cycle route from the University, Galleria and South Hatfield to the station. The photo shows where the shared use path turns south from French Horn Lane to run alongside Queensway. The WHBC 2030 vision for Hatfield and our Space For Cycling plans say there should be a crossing of Queensway here, straight on in this picture, linking up with the Wellfield Road cycle route. See Business Park phase 3 below. A short section of cycle route is planned from the A1000 Hertford Road west along side the section of Mount Pleasant Lane which is also the slip road to the A414. 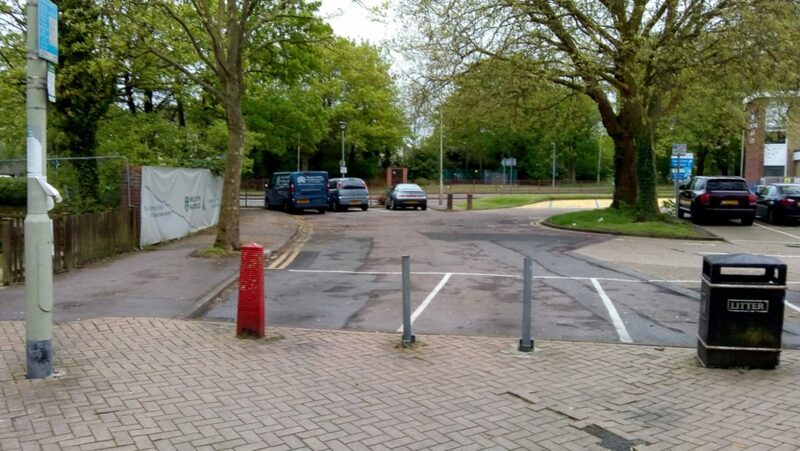 You can see the desire line to the left of the posts in the photo below which is taken looking west from the A1000. From the junction with Pleasant Rise there will be works to make the western section of Mount Pleasant Lane safer. As yet nothing is planned to then link this up to Tesco. It will create a route off National Routes 12 and 61 almost to the Ryde Primary School. 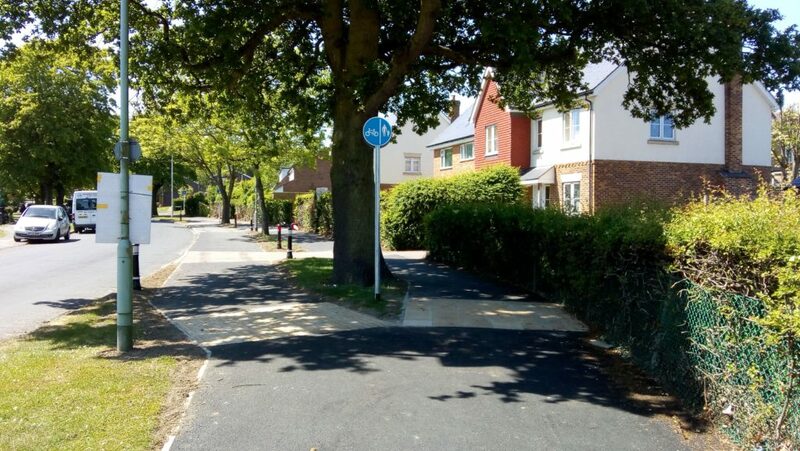 We have suggested that the residential section of Mount Pleasant Lane and Pleasant Rise up to the school should be a 20 mph zone to enourage cycling to school. This project has been split into three phases. Phase 1, from Hatfield station to the west end of French Horn Lane was completed in 2010. Not included was a link to Old Hatfield via the Batterdale subway as this is deemed too low to be safely used, despite there being other routes in other towns which are much lower. Sustrans says in its guidelines “we consider it preferable having “substandard” clearance than either a blockage or a dangerous road crossing”. This section connects with the Great North Way (NCN12). A possible alternative route will be created once Salisbury Square is redeveloped. Phase 2, from The Common to Comet Way, was completed in October 2012. The scheme was funded by developer funding from the business park development (Section 106 contributions.) It connects to the Alban Way (NCN61) on Wellfield Road and the Great North Way (NCN12). Phase 3 is the section from The Common to French Horn Lane. Following WelHatCycling’s critical comments about the proposed on-road section on the Queensway roundabout, the plans were revised to include a Toucan crossing of Queensway with a route round the north east edge of the new town centre. 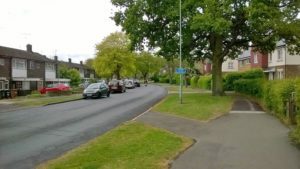 WelHatCycling have proposed that, should the town centre remain much as it is, the cycle path should come across the very north end of the town centre along the original line of Wellfield Road to meet the proposed toucan crossing by the clinic. What happens will depend on how the town centre is redeveloped. 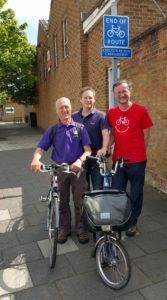 In June 2015 WelHatCycling members Adam Edwards and Chris Whitehouse met with Grant Shapps MP to discuss the Hatfield Town Centre missing link, the short section between French Horn Lane and Wellfield Road across the north east end of the Town Centre. Grant fully appreciated the merits of our proposal which includes a toucan crossing of Queensway by the Queensway Health Clinic and was supportive of it. He agrees that the proposal fits in well with the upcoming development of the north east end of the Town Centre, which includes an anchor store and postgraduate halls of residence for the University of Hertfordshire. He could see the need for pedestrian and cycle access across Queensway, which then creates a continuous link between Hatfield Railway Station and the Business Park, and provides access to the shops at that end of the Town Centre. He has already had meetings with the larger stakeholders including the University of Hertfordshire, Hertfordshire County Council, Welwyn Hatfield Borough Council, Gascoyne Cecil Estates and Hatfield Town Council and suggested WelHatCycling should be included in future discussions. 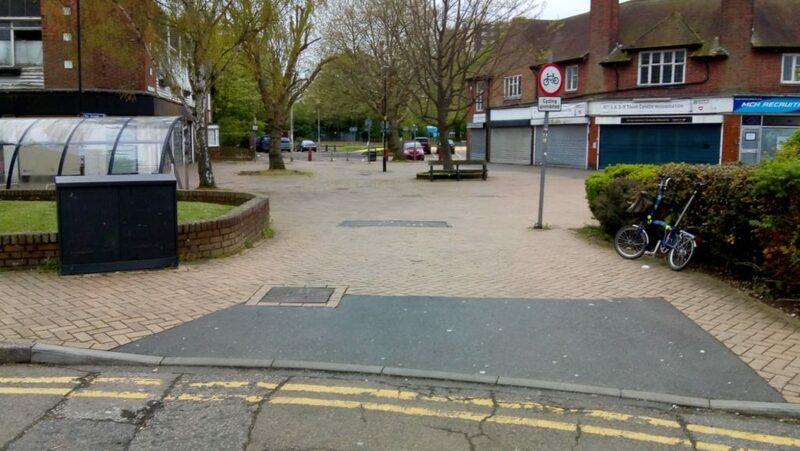 In addition to £2.6m already committed to the development of the Town Centre, Welwyn Hatfield Borough Council has also received £6m so the cost of the crossing and the associated short section of cycle path should, in Grants view, be a small and easily funded part of the wider project. 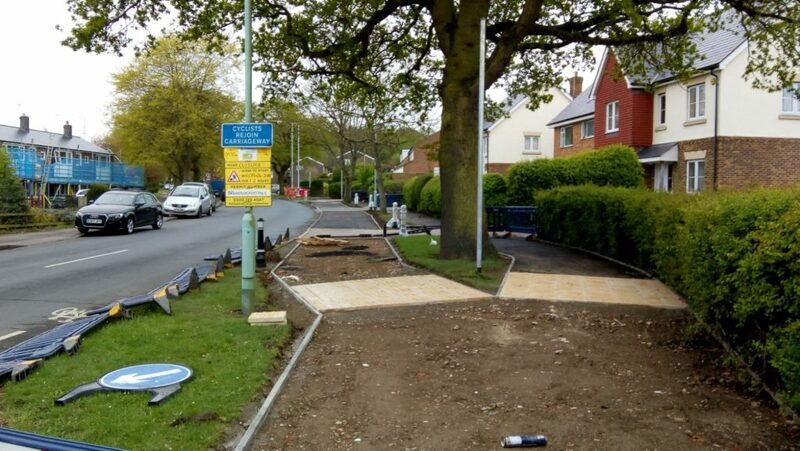 It certainly helped that we had recently been in contact with WHBC councillors, particularly Lynne Sparks (now Mayor), and that Colin Haigh, Head of Planning for WHBC, has been in contact with the Hertfordshire Local Access Forum on the proposal. Our involvement with the University of Hertfordshire over local cycling issues also helped, and students had expressed their appreciation to Grant of our information stall and Dr Bike at the recent University Wellbeing day. We hope this might lead to speedier progress on this much needed link. The link has been included in the WHBC 2030 vision for Hatfield. At recent meetings about the refurbishment of White Lion Square, we were assured the phase three works are indeed planned and will happen as and when that section of the town centre is rebuilt. As the photos below show, there is plenty of room even now to build a route from Wellfield Road to Queensway where a crossing could easily be built.